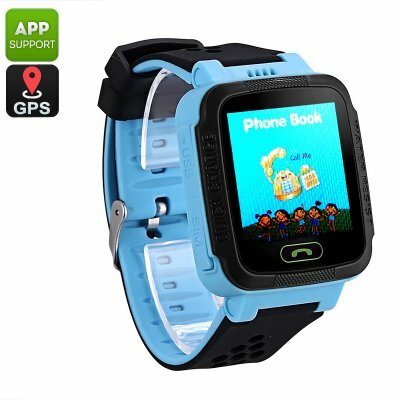 Successfully Added Kids GPS Tracker Watch - GPS, LBS, Digital Fence, Calls, Messages, SOS, Games, App Support, 400mAh, Step Counter, GSM (Blue) to your Shopping Cart. This stylish gizmo is so much more than your regular kids watch. By supporting one GSM SIM card, this cool gadget allows you to communicate with your son or daughter at any time. A built-in speaker and microphone let you make calls whereas the touch screen makes it easy to send out messages. By allowing you to white-list certain phone numbers, you can be guaranteed that your little one never receives an unwanted call or text message from an unknown source. Additionally, this kid’s watch also supports an SOS feature that lets your child reach out to you in case of an emergency. With a small yet powerful 400mAh battery in place, this little GPS watch brings along days’ worth of standby time for you to enjoy. By supporting real-time GPS tracking, this kids GPS tracker lets you keep accurate track of the whereabouts of your son or daughter at any time. The watch works with GPS and LBS double location for highly-accurate positioning. It furthermore supports remote monitoring and a digital fence feature that informs you whenever your little one wanders off too far. With these security features in place, you’ll always be aware of the current location of your child – significantly increasing the safety of your son or daughter. The watch furthermore supports basic puzzle games for your child’s entertainment and comes with a pedometer that keeps track of the daily activity levels. This GPS watch comes with a 12 months warranty, brought to you by the leader in electronic devices as well as wholesale electronic gadgets..
Distribution Restriction: please note this product is already restricted to certain exclusive distributors in the following list of countries and therefore we cannot offer delivery there. Everywhere else apart from the following list of countries is OK.